But what does that mean exactly? The use of organic cottons? The use of natural or recycled fibers? Donation of a percentage of sales to a charitable cause? Socially responsible methods of production? Yes. All that and more. It’s also about avoiding waste. A single textile factory produces up to 60,000 pounds of waste per week. Textile garbage poses a threat to local groundwater supplies. Every time it rains, water drains through all the garbage and picks up chemical and hazardous materials. This includes dyes and bleaches used in production of fabrics. Did you know that textile waste is 70x worse on the preproduction side than on the post-production side. China’s textile industry is responsible for 52-54 percent of the world’s total production, and creates about 3 billion tons of soot each year. Millions of tons of unused fabric go to waste each year at Chinese mills when they are dyed the wrong color. A single mill in China can use 200 tons of water for each ton of fabric it dyes; many rivers run with the colors of the season as the untreated toxic dyes wash off from mills. Fashion Designer Daniel Silverstein is committed to reducing waste in the production chain. He runs a company called ZeroWasteDaniel, which attempts to create clothing with zero waste. He has created a unique draping technique that keeps fabric waste close to zero, and he uses the excess fabric from, e.g., armhole cutouts to add applique detailing to his clothes. Portland-based Looptworks has a different strategy. This company makes all its products using high-quality excess materials destined for the dump. They design clothes using only the materials they find. The designers search through textile mills and warehouses around the world to retrieve brand new fabric, leather scraps, thread, buttons and zippers. 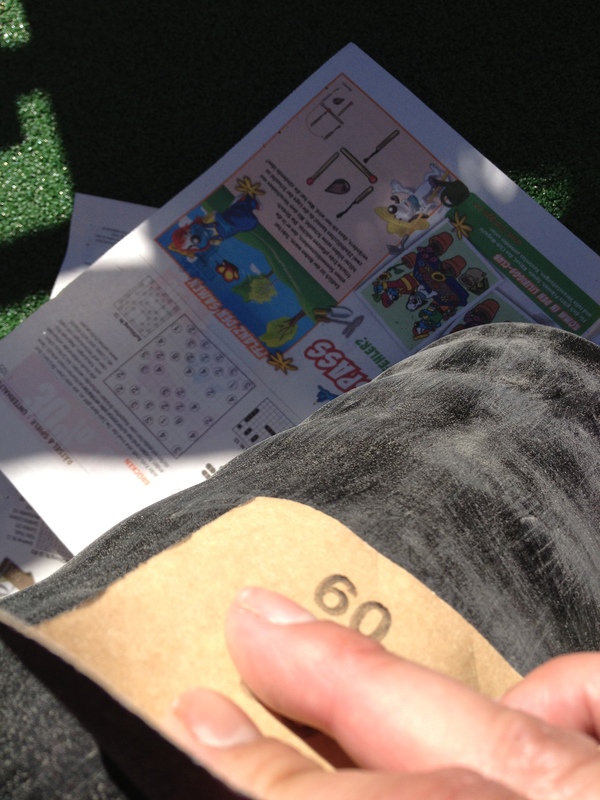 Although I am not a big-time fashion designer, I am also committed to reducing waste. 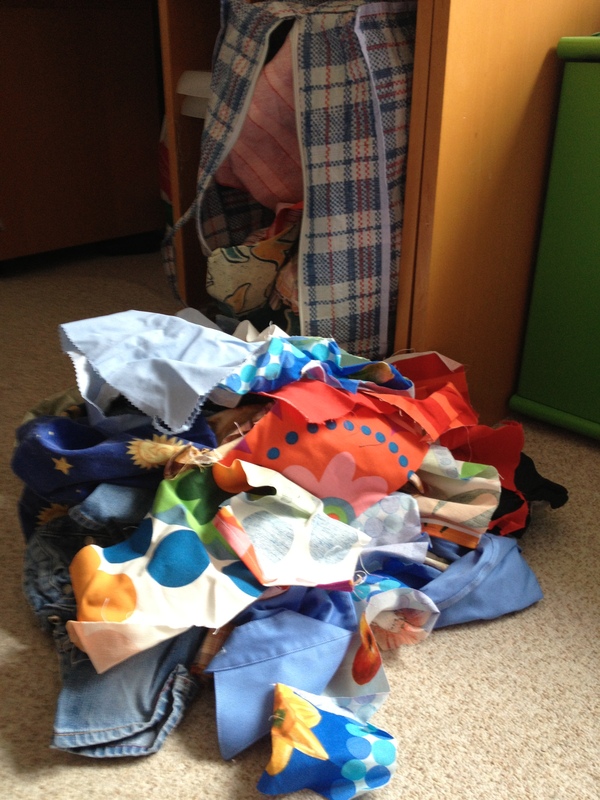 I keep this sack of remnants from recycled garments and projects. 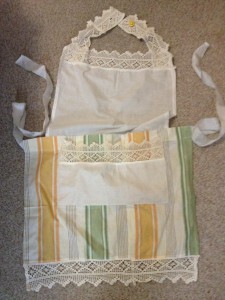 I go to it when I need to make gifts and giveaways—like these keychains for the boys’ teachers or this apron. 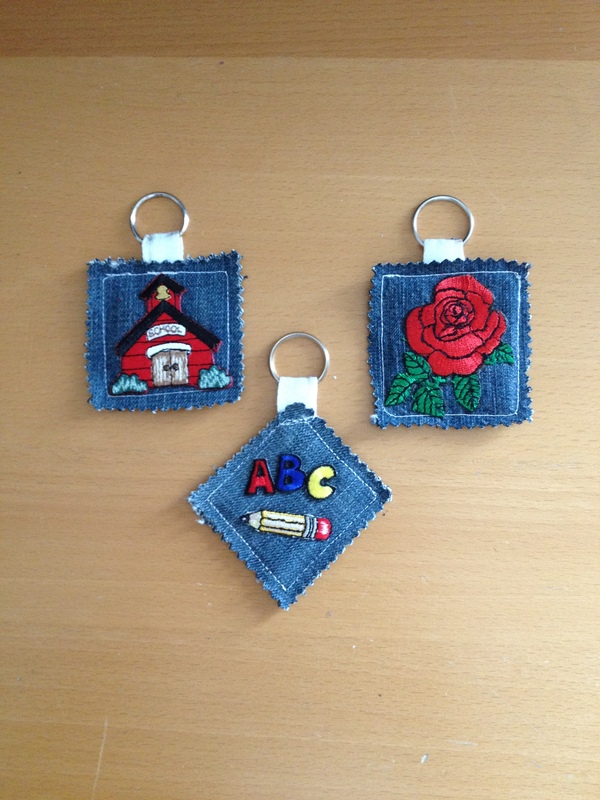 Holiday presents for the teachers—made out of old jeans. Then, I applied my scraps layer by layer….and voila. It’s a lot more cheerful than boring old black. 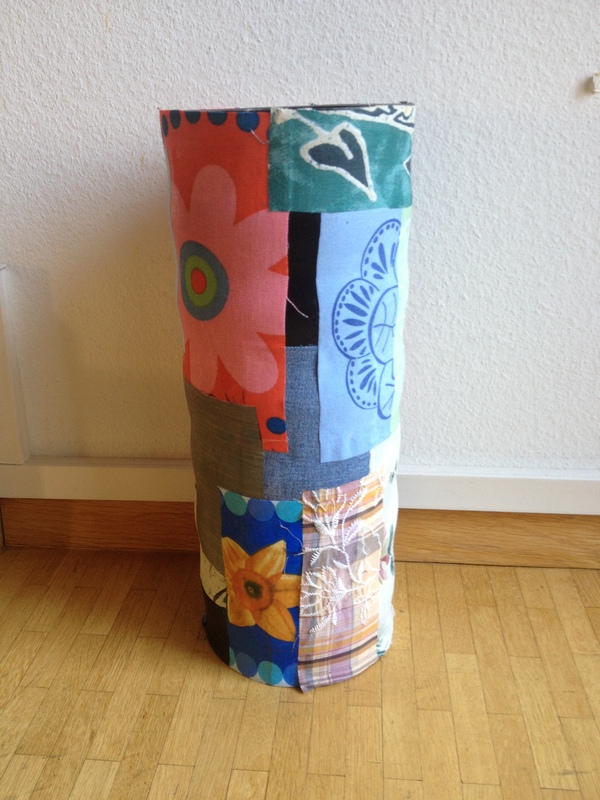 I feel good because I have increased the total life span of both the umbrella stand and the fabrics. Did you know that Americans discard an estimated 68 pounds of clothing a year, 99 percent of which could have been recycled. Clothing and household textiles, consisting of cotton, polyester, nylon and rayon, make up almost 5 percent of the total garbage in landfills. So what can you do? Recycle. Reuse. Buy secondhand. Pay attention to where your clothes are made. And support sustainable fashion. Kudos for you! Hope this goes far and wide to awaken others to their desecration of this unbelievably magnificent planet.